Feed back carb, hei ignition?? Ohh look, its an angry Eagle. Is it possible to use the original Carter feedback carburetor with a Gm H.E.I. distributor? I Don't know why. 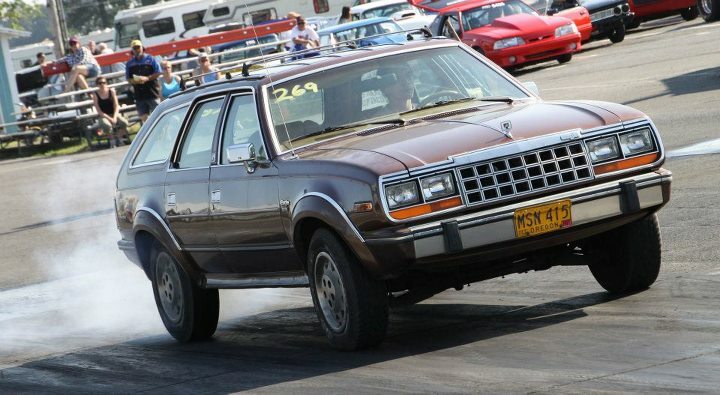 But everybody's always talking about their STI or That guys EVO, I think I'll stick with my old, but reliable AmC. Did I ever tell you I was Full blooded Eagle? Re: Feed back carb, hei ignition?? Before you pull the dist or mess with the wiring, turn the key on cold and unplug the connector on the back of the carb. Then it won't mess with the idle and it will not have too lean/too rich running happening. If you mod the HEI to use a later GM system, the distributors have a connector for computer controlled timing for EFI, but I'm not sure how to wire it to work with the BBD. TBI systems run them. So When you say turn it on cold You mean key on but don't start then remove the connector from the stepper on the back of the carburetor? The distributor that I am using will be the early H.E.I. Another question I have is, when does the light on the dash for service emissions come on? I have never seen this light illuminated. Thank you both for the information I will be doing this tomorrow or later this week. Realistically, you should be able to wire up the HEI module in the exact way of the factory ignition module but without the resistor wire. This would provide the computer to still control ignition timing. The "Ignition Maint" light was only used on the cars with the Iron Duke, and possibly the AMC 2.5, but was not used on models with the 258. Yes. Key on cold but not running. Pull the plug and be done with it. Ford, GM, and MSD all use the same trigger system. It should work just fine. In fact there are write-ups on using a HEI module and remote coil with the stock (or aftermarket) distributor. No Idle and Back firingProblems Solved !